Bookworm1 was a huge fan of Barefoot Books' musical books with singalong CD's when he was younger - his favorite being Knick Knack Paddy Whack (which I reviewed before and if you click on the title it will take you to my prior review.) Therefore it should really come as no surprise that Bookworm2 is equally attracted to stories through song, Barefoot-style. 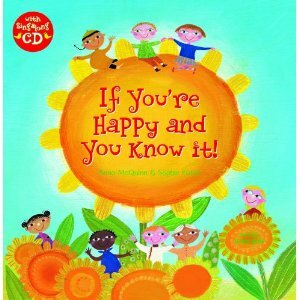 Then again, it really doesn't come as any surprise to me that any child would like these music/book compilations because they are engaging and fun, welcoming children in to a world with singing, dancing, and much clapping of hands. There are two songs that I have sung with Bookworm2 since his arrival into our family: Eensy, Weensy Spider and If You're Happy and You Know It, that caused some fun interactions between the two of us. When I saw that Barefoot Books had a singalong for If You're Happy and You Know It , I knew he'd be a huge fan. I was completely right! He loves it! In this particular version of the song, they chose the phrase, "If you're happy and you know it, and you really want to show it" instead of the original "then you're face will really show it" but he doesn't seem to mind the change up. Read this book or sing along with it - either which way it's guaranteed fun. It didn't take me long to figure out that Octopus Opposites would be a hit around these parts! And the thin octopus, he declares, is actually a squid. This does not bother him in the least because his second favorite tentacled creature is the squid (third being the jellyfish) so this book just got better, as far as Bookworm1 is concerned! Illustrated by Stephanie Bauer, (who apparently lives in Oregon! ), this book is bright, lively and creative good fun. There are all kinds of creatures in here that we've found reason to love from pelicans, to beluga whales, to kookaburras! The book is very bright and cheerful and deals with some fun opposites such as bold and shy, empty and fall, climb and fall, etc. 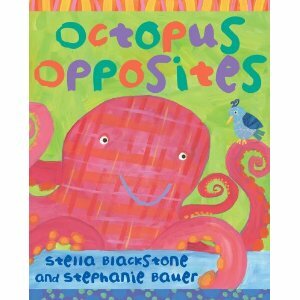 Octopus Opposites is absolutely a winner in our home and we recommend it to you. Of course, we tend to be quick to recommend Barefoot Books because they are a fantastic children's book company. To find out more about why I like them, see my post over at Reading My Library. In the meantime, thanks, Barefoot Books, for providing two perfect titles for two kids that I think are pretty special. And yes, dimples are adorable!! I love your little guy's. Kyle has them, but they aren't deep and fat, but when they show up, I melt. Those books look great. We've enjoyed quite a few Barefoot Books around these parts as well. I've been wanting to find a good book about an octopus. My daughter likes the Beatles' song Octopus's Garden and she made an octopus out of a sock just last week. I just love Barefoot Books. The colors on those covers make me want to read them. I am also not surprised that an Octopus book ranks highly at your house!